This is a large genus of over 1200 described species. Most species are found in north temperate regions, although two smaller centers of diversity exist in the southern hemisphere (the Andes mountains of South America, as well as New Zealand). Adults are common, small predators and scavengers along bodies of water, from rapidly flowing mountain streams to lowland ponds. Several species living in more xeric conditions, including deserts. Some pictures of Bembidion structure are shown here. Erwin, T. L. 1982. Small terrestrial ground-beetles of Central America (Carabidae: Bembidiina and Anillina). Proceedings of the California Academy of Sciences, 42: 455–496. Erwin, T. L. 1984. Studies of the Tribe Bembidiini (Coleoptera: Carabidae): Lectotype designations and species group assignments for Bembidion species described by Thomas L. Casey and others. Pan-Pacific Entomologist, 60: 165–187. Erwin, T. L., and D. H. Kavanaugh. 1981. Systematics and zoogeography of Bembidion Latreille: I. The carlhi and erasum groups of western North America (Coleoptera: Carabidae, Bembidiini). Entomologica Scandinavica Supplement, 15: 33–72. Jeannel, R., 1941. Coléoptères Carabiques. Part 1. Faune de France 39, 1-571. Jeannel, R., 1962. Les Trechides de la Paléantarctide occidentale. In: Deboutteville, C.D., Rapoport, E. (Eds. ), Biologie de l'Amérique Australe, Études sur la Faune du Sol, Paris, pp. 527-655. Kryzhanovskij, O.L., Belousov, I.A., Kabak, I.I., Kataev, B.M., Makarov, K.V., Shilenkov, V.G., 1995. A checklist of the ground beetles of Russia and adjacent lands (Insecta, Coleoptera, Carabidae). PENSOFT Publishers, Sofia & Moscow. Liebherr, J.K., 2008. Taxonomic revision of Hawaiian Bembidion Latreille (Coleoptera: Carabidae: Bembidiini) with a discussion of their reductive and derivative evolutionary specializations. Annals of Carnegie Museum 77, 31-78. Lindroth, C.H. 1963. The ground-beetles (Carabidae, excl. Cicindelinae) of Canada and Alaska. Part 3. Opuscula Entomologica, Supplementum XXIV, pp. 201–408. Lindroth, C.H. 1976. Genus Bembidion Latreille (Coleoptera: Carabidae) in New Zealand: a revision. New Zealand Journal of Zoology, 3: 161–198. Lindroth, C.H. 1980. A revisionary study of the taxon Cillenus Samouelle, 1819 and related forms (Coeloptera [sic]: Carabidae, Bembidiini). Entomologica Scandinavica, 11: 179–205. Maddison, D. R. 1985. Chromosomal diversity and evolution in the ground beetle genus Bembidion and related taxa (Coleoptera: Carabidae: Trechitae). Genetica 66(2): 93-114. Maddison, D. R. 1993. Systematics of the Holarctic beetle subgenus Bracteon and related Bembidion (Coleoptera: Carabidae). Bulletin of the Museum of Comparative Zoology 153(3): 143-299. Maddison, D.R., 2008. Systematics of the North American beetle subgenus Pseudoperyphus (Coleoptera: Carabidae: Bembidion) based upon morphological, chromosomal, and molecular data. Annals of Carnegie Museum 77, 147-193. Marggi, W., Huber, C., Müller-Motzfeld, G., Hartmann, M., 2003. 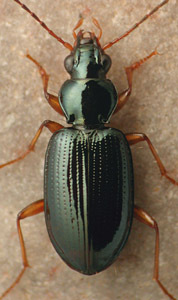 Carabidae: Trechinae: Bembidiini: Bembidiina. In: Löbl, I., Smetana, A. (Eds. ), Catalogue of Palaearctic Coleoptera. Apollo Books, Stenstrup, pp. 241-273. Moret, P., Toledano, L., 2002. Ecuadion, new subgenus of Bembidion Latreille from Ecuadorian paramo (Coleoptera, Carabidae, Bembidiini). Bollettino del Museo Civico di Storia Naturale di Venezia 53, 155-205. Müller, J. 1918. Bestimmungstabelle der Bembidion-Arten Europas und des Mittelmeergebietes. Koleopterologische Rundschau, 7: 26–117. Netolitzky, F. 1942, 1943. Bestimmungstabelle der Bembidion-Arten des paläarktischen Gebietes. Koleopterologische Rundschau, 28: 29–124, 29: 1–70. Ortuño, V.M., Toribio, M., 2005. 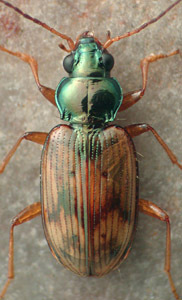 Carabidae de la Peninsula Ibérica y Baleares. Vol. I Trechinae, Bembidiini. Argania editio, Barcelona. Perrault, G. G. 1981. 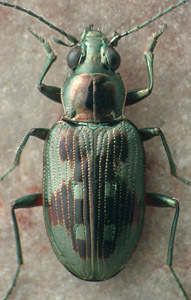 Etudes sur la tribu des Bembidiini (Coleoptera, Carabidae) I. Notes sur la classification supraspécifique. Nouvelle Revue d'Entomologie, 11: 237–250. Perrault, G. G. 1982. Etudes sur la tribu des Bembidiini s. str. (Coleoptera, Carabidae). II. Révision du sous-genre Cyclolopha (Casey). Entomologica Basiliensia, 7: 89–126. Schuler, L. 1959. Le genre Microserrulula Netolitzky (Bembidiini Jeannel, Col. Trechidae) les formes multispires. Revue française d'Entomologie, 26: 96–105. Serrano, J. 1981a. A chromosome study of Spanish Bembidiidae and other Caraboidea. Genetica 57: 119-129. Toledano, L., 2000. Systematic notes on the Palaearctic Bembidiini with particular reference to the fauna of China (Coleoptera Carabidae). Memorie della Societa Entomologica Italiana 78, 5-70. Toledano, L., 2002. Nomenclatorial revision of the supraspecific taxa of Bembidiini s.str. of South America described by Jeannel (1962) and related taxa with some descriptions of the fauna of South America (Coleoptera: Carabidae). Koleopterologische Rundschau 72, 1-14. Toledano, L., 2005. The Australian species of Bembidion Latreille, 1802: a taxonomic treatment, with notes about Gondwana as an evolutionary source area (Coleoptera, Carabidae, Bembidiini). Museo Regionale di Scienze Naturali Monografie (Turin) 42, 73-136. Toledano, L., 2008a. Checklist of the Bembidiina of China (Coleoptera Carabidae). Memorie del Museo Civico di Storia Naturale di Verona (IIA Serie) Sezione Scienze della Vita 18, 95-100. Toledano, L., 2008b. Systematic notes on the Bembidiina of the northern Andes with particular reference to the fauna of Ecuador (Coleoptera, Carabidae). Memoirs on Biodiversity 1, 81-130. Toledano, L., 2008c. Systematic notes on the Palaearctic Bembidion Latreille, 1802 (Coleoptera, Carabidae) with particular reference to the fauna of China. Memorie del Museo Civico di Storia Naturale di Verona (IIA Serie) Sezione Scienze della Vita 18, 5-46. Toledano, L., Schmidt, J., 2008. Review of the species of Bembidion subg. Bembidionetolitzkya Strand, 1929 from Southwestern China and Tibet with description of 22 new taxa (Coleoptera, Carabidae, Bembidiina). Memorie del Museo Civico di Storia Naturale di Verona (IIA Serie) Sezione Scienze della Vita 18, 47-78. Toledano, L., Schmidt, J., 2010. Revision of the Bembidion kara Andrewes, 1921 species group and notes on the Palaearctic species of Bembidion subgenus Trichoplataphus Netolitzky, 1914 (Coleoptera, Carabidae, Bembidiini). Entomologische Blätter für Biologie und Systematik der Käfer 106, 371-406. Toledano, L., Sciaky, R., 1998. Three subgenera of Bembidion new to China, with description of a new species (Coleoptera Carabidae). Bollettino del Museo Civico di Storia Naturale di Venezia 48, 97-114. Page: Tree of Life Bembidion Latreille 1802. Authored by David R. Maddison. The TEXT of this page is licensed under the Creative Commons Attribution License - Version 3.0. Note that images and other media featured on this page are each governed by their own license, and they may or may not be available for reuse. Click on an image or a media link to access the media data window, which provides the relevant licensing information. For the general terms and conditions of ToL material reuse and redistribution, please see the Tree of Life Copyright Policies.